When he arrived in Indonesia’s Java, British Statesman Sir Thomas Stamford Raffles rediscovered an ancient civilisation, and a forgotten Buddhist temple that went on to be crowned the world’s largest of its kind. Two hundred years on, Borobodur remains a place of cultural, physical and spiritual beauty. Many relics are obliged to commune and co¬exist with modern development, jostling for space among suburbia and structures that are low on architectural nuance. Not Borobudur. The 8th-Century Buddhist sanctuary sits serenely in the rural heartland of Central Java, an hour’s drive from Yogyakarta, Indonesia’s unofficial cultural capital. Two frisky volcanoes flank the temple, like gatekeepers of the majestic. The bigger of the two, Mt Merapi, frequently likes to spiff smoke out of its crater, with its most significant eruption gripping the Kedu Plain in 2010. With this in mind, the fact that Borobudur lay hidden by volcanic ash and wild jungle for over a thousand years doesn’t seem so impossible after all. With no inner sanctuary or chamber suggesting a place for monks to meditate, archaeologists believe the temple proper was envisioned as a visual aid for teaching the Buddhist philosophies of life. Structurally designed by the rulers of the Shailendra Dynasty as a big, beautiful three-dimensional stone mandala (circle), Borobudur represents the universe in Hindu and Buddhist symbolism. At its essence it is a diagram of the cosmos, used for meditation. Galleries ring the structure, with a total of 2672 relief panels carved into stone, and 504 statues of the Buddha. 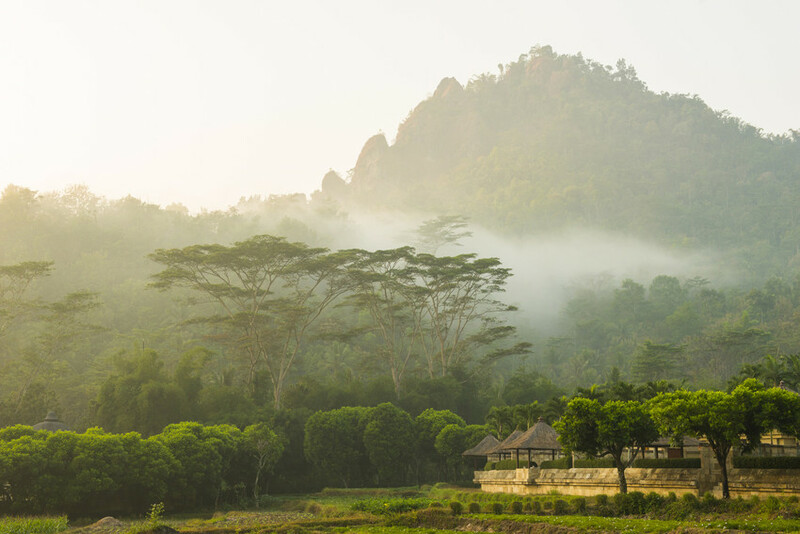 Warm swirling mists at Aman Resorts’ Amanjiwo at the foot of the Menoreh Hills in Java. 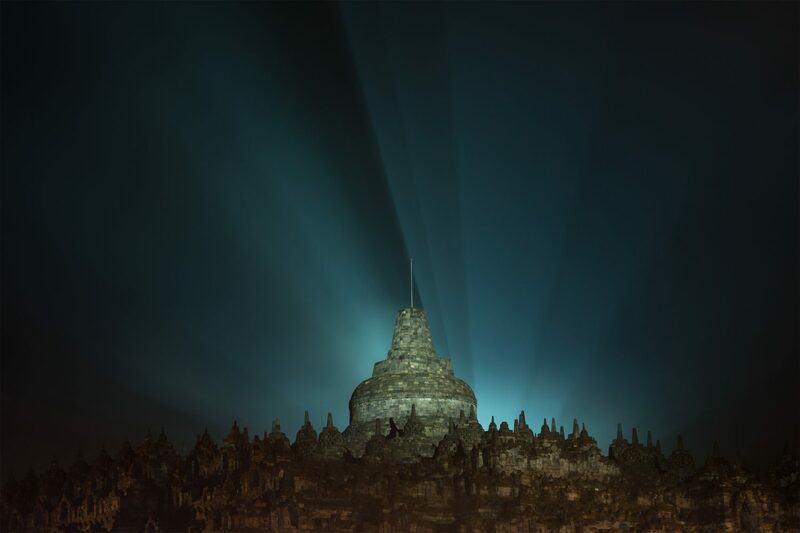 At no time is the temple’s presence more strongly felt than at 4.30am, while wielding a torch and surmounting the final step of Borobudur’s ‘peak’. The upper section is referred to as Arupadhatu — realm of formlessness — representing a stage in the journey through meditation to Nirvana. Having risen from the lower steps, the realm of desires, and past the second tier, the realm of forms, the entire valley splays out below. Waiting for sunrise here is an experience of pure spaciousness, mental and physical. Surveying from up here, the surrounding tobacco and rice fields, clove plantations, and tropical forest seem like an organic extension of the mandala, circling outwards, ripple-like. Once the panorama has been sufficiently gazed upon, the circumnavigation of Borobudur’s three upper pathways can be performed much like a walking meditation. Of course, by 5.30am, season dependent, the temple has accommodated its fair share of visitors. However, it’s not so hard to find a quiet space to reflect. To take a few minutes of solitude here is to appreciate the prana, or life force, that hangs alert in the air. Happily, gunning it back to Yogyakarta for a forgettable hotel room stay doesn’t have to be the post-temple experience. Those yearning to escape bourgeois routine for a while longer can stay at Amanjiwo. 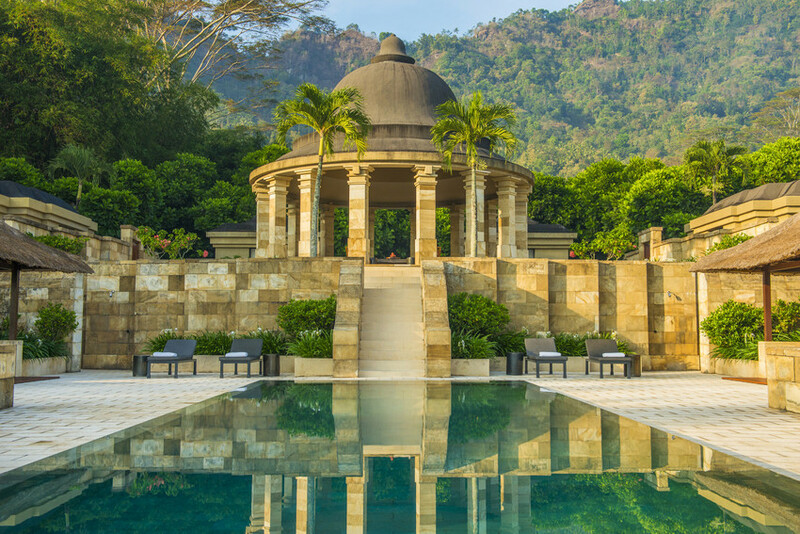 Part of the clique of Aman Resorts globally, Amanjiwo appears to serenade Borobudur from across the valley. Tucked into its own natural amphitheatre at the foot of the Menoreh Hills, warm mists swirl around 11 hectares of grounds. The property’s circular monolith main hall sits in tribute to its ancient neighbour, built from blocks of local limestone and contained by a moat. Recalling the temple itself, a set of steep steps extend dramatically upwards to the main entrance, and there at the top sits a framed Borobudur for more viewing pleasure. Guests who wake early in the throes of jet lag are treated to an arrow-straight shot of the temple’s stupa-¬ridden silhouette at sunrise. 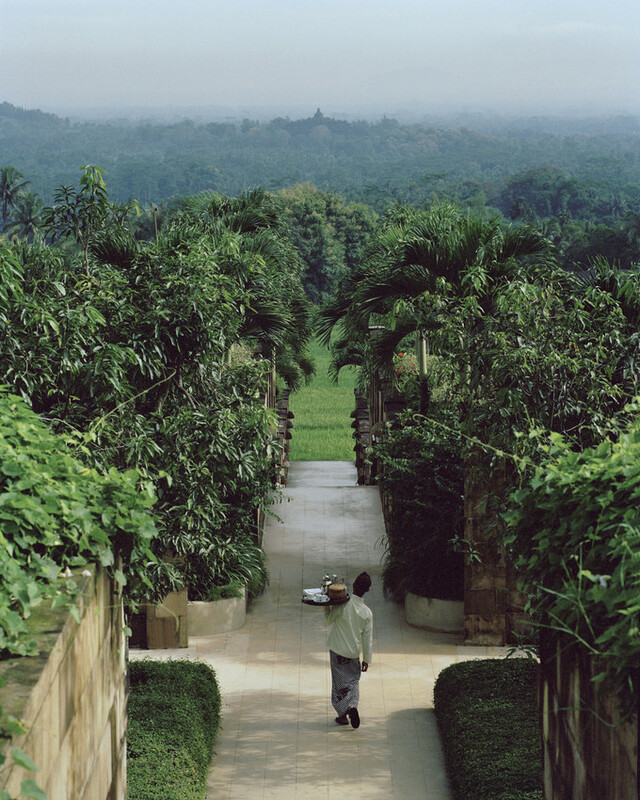 Raffles may have re-discovered Borobudur in 1814, but he wasn’t so lucky as to be doted upon at Amanjiwo. Rather than a stop while passing by to the coast, this should be the final destination.